“I don’t have time to cook” is a common enough complaint among busy people; we would like to have more time for food, but life’s other demands interfere. And yet for the Beechers—that astonishingly overachieving Yankee family—accomplishment in the ministry, in politics, in education, and in the arts seems to have gone hand-in-hand with an abiding interest in eating well and everything that entails. Sister Catharine, founder of colleges and advocate of reform in the education of women, also wrote one of her century’s leading home-ec manuals, A Treatise on Domestic Economy (1841). Sister Harriet, the famous author of Uncle Tom’s Cabin, published extensively on cookery as well. And brother Henry, the most celebrated preacher of his day, occasionally discussed household concerns and food in “Thoughts as they Occur, by one who keeps his Eyes and Ears open,” his weekly column in the New York Ledger. A number of these pieces were collected in a book titled, appropriately enough, Eyes and Ears (1862). The making of pies at this period [c. 1810s and 1820s] assumed vast proportions that verged upon the sublime. Pies were made by forties and fifties and hundreds, and made of everything on the earth and under the earth. The pie is an English institution, which, planted on American soil, forthwith ran rampant, and burst forth into an untold variety of genera and species. Not merely the old traditional mince pie, but a thousand strictly American seedlings from that main stock, evinced the power of American housewives to adapt old institutions to new uses. Pumpkin pies, cranberry pies, huckleberry pies, cherry pies, green-currant pies, peach, pear, and plum pies, custard pies, apple pies, Marlborough-pudding pies,—pies with top crusts and pies without,—pies adorned with all sorts of fanciful flutings and architectural strips laid across and around, and otherwise varied, attested the boundless fertility of the feminine mind, when once let loose in a given direction. Take fair apples; pare, core, and quarter them. Take four tablespoons of powdered sugar to a pie. Put into a preserving pan, with the sugar, water enough to make a thin syrup; throw in a few blades of mace, boil the apples in the syrup until tender, a little at a time, so as not to break the pieces. Take them out with care, and lay them in soup dishes. When you have preserved apples enough for your number of pies, add to the remainder of the syrup, cinnamon and rosewater, or any other spice, enough to flavor it well, and divide among the pies. Make a good paste, and line the rim of the dishes, and then cover them, leaving the pies without an under crust. Bake them a light brown. For his part, Henry Ward Beecher devoted an entire column to apple pies. His light-hearted essay reveals stanch opinions on the proper components of the perfect specimen: the crust, the spices, and (of course) the apples. Below we present his paean to “Apple-Pie” as our Story of the Week selection. Note: The first paragraph of the above introduction is taken, with slight modification, from Molly O’Neill’s headnote for Beecher’s essay in American Food Writing. For this week’s selection, we depart from the usual format and reproduce Beecher’s essay in full below. You may also download it as a PDF or view it in Google Docs. How often people use language without the slightest sense of its deep, interior meaning! Thus, no phrase is more carelessly or frequently used than the saying, “Apple-pie order.” How few who say so reflect at the time upon either apple-pie or the true order of apple-pie! Perhaps they have been reared without instruction. They may have been born in families that were ignorant of apple-pie; or who were left to the guilt of calling two tough pieces of half-cooked dough, with a thin streak of macerated dried apple between them, of leather color, and of taste and texture not unbecoming the same,—an apple-pie! But from such profound degradation of ideas we turn away with gratitude and humility, that one so unworthy as we should have been reared to better things. We are also affected with a sense of regret for duty unperformed; for great as have been the benefits received, we have never yet celebrated as we ought the merits of apple-pie. That reflection shall no longer cast its shadow upon us. “Henry, go down cellar, and bring me up some Spitzenbergs.” The cellar was as large as the whole house, and the house was broad as a small pyramid. The north side was windowless, and banked up outside with frost-defying tan-bark. The south side had windows, festooned and frescoed with the webs of spiders, that wove their tapestries over every corner in the neighborhood, and, when no flies were to be had, ate up each other, as if they were nothing but politicians, instead of being lawful and honorable arachnidæ. On the east side stood a row of cider-barrels; for twelve or twenty barrels of cider were a fit provision for the year,—and what was not consumed for drink was expected duly to turn into vinegar, and was then exalted to certain hogsheads kept for the purpose. 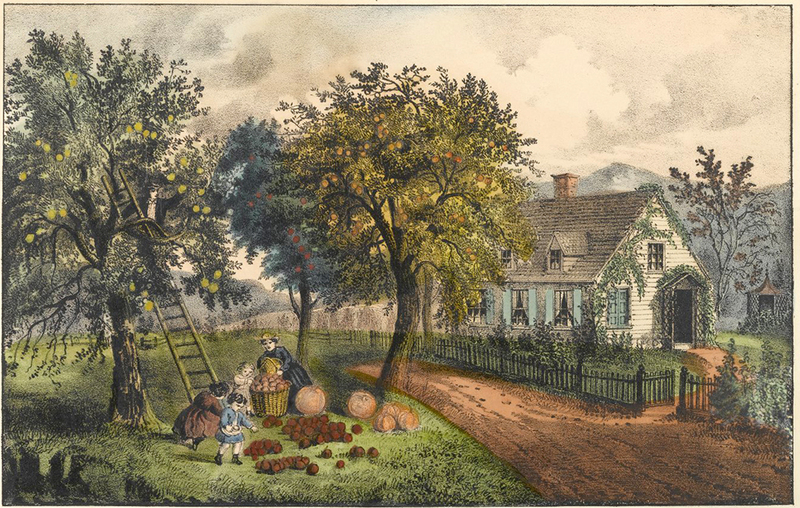 But along the middle of the cellar were the apple-bins; and when the season had been propitious, there were stores and heaps of Russets, Greenings, Seeknofurthers, Pearmains, Gilliflowers, Spitzenbergs, and many besides, nameless, but not virtueless. Thence selecting, we duly brought up the apples. Some people think anything will do for pies. But the best for eating are the best for cooking. Who would make jelly of any other apple, that had the Porter? who would bake or roast any other sweet apple, that had the Ladies’ Sweeting,—unless, perhaps, the Talman Sweet? and who would put into a pie any apple but Spitzenberg, that had that? Off with their jackets! Fill the great wooden bowl with the sound rogues! And now, O cook! which shall it be? For at this point the roads diverge, and though they all come back at length to apple-pie, it is not a matter of indifference which you choose. There is, for example, one made without under-crust, in a deep plate, and the apples laid in, in full quarters; or the apples being stewed are beaten to a mush, and seasoned, and put between the double paste; or they are sliced thin and cooked entirely within the covers; or they are put without seasoning into their bed, and when baked, the upper lid is raised, and the butter, nutmeg, cinnamon, and sugar are added; the whole well mixed, and the crust returned as if nothing had happened. But O be careful of the paste! Let it not be like putty, nor rush to the other extreme, and make it so flaky that one holds his breath while eating for fear of blowing it all away. Let it not be plain as bread, nor yet rich like cake. Aim at that glorious medium, in which it is tender, without being fugaciously flaky; short, without being too short; a mild, sapid, brittle thing, that lies upon the tongue, so as to let the apple strike through and touch the papillæ with a mere effluent flavor. But this, like all high art, must be a thing of inspiration or instinct. A true cook will understand us, and we care not if others do not! Do not suppose that we limit the apple-pie to the kinds and methods enumerated. Its capacity in variation is endless, and every diversity discovers some new charm or flavor. It will accept almost every flavor of every spice. And yet nothing is so fatal to the rare and higher graces of apple-pie as inconsiderate, vulgar spicing. It is not meant to be a mere vehicle for the exhibition of these spices, in their own natures. It is a glorious unity in which sugar gives up its nature as sugar, and butter ceases to be butter, and each flavorsome spice gladly evanishes from its own full nature, that all of them, by a common death, may rise into the new life of apple-pie! Not that apple is longer apple! It, too, is transformed. And the final pie, though born of apple, sugar, butter, nutmeg, cinnamon, lemon, is like none of these, but the compound ideal of them all, refined, purified, and by fire fixed in blissful perfection. But all exquisite creations are short-lived. The natural term of an apple-pie is but twelve hours. It reaches its highest state about one hour after it comes from the oven, and just before its natural heat has quite departed. But every hour afterward is a declension. And after it is one day old, it is thenceforward but the ghastly corpse of apple-pie. Wonderful. First, there is nothing on Earth more delicious than pie. Why can't we eat it three times a day & at midnight of course? What would be wrong with that, I ask. Also I so enjoy contemporaneous accounts, including the fictional, of domestic life in America in the 19th & early 20th centuries.